The application of Bayesian Networks (BN) in dependability is a relatively recent development. Their popularity grew in the area of reliability analysis of systems, since the years 90s. A large number of scientific publications in this area shows the interest in the applications of BN in the field of dependability and risk analysis. The most important publications demonstrate equivalence with probabilistic methods conventionally used in dependability. The modelling formalism by BN is not based on a specific semantic in dependability but offers a general formalism for modelling problems under uncertainty. This plenary talk explains the principles of knowledge structuration to ensure a valid BN model and illustrate the flexibility and efficiency of Probabilistic Graphical Models in various frameworks such as: Risk Assessment, Maintenance policy evaluation, Fault Diagnosis, and Model Predictive Control. Philippe Weber received the Ph.D. degree in 1999 from the Institut National Polytechnique de Grenoble. He is Professor at Université de Lorraine, and a member of the Research Centre for Automatic Control of Nancy (CRAN) since 2000. He focuses his interest on modeling problem in maintenance, prognosis and reliability. He develops fault-tolerant control systems including reliability analysis. 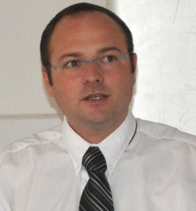 Since 2000 his research interest is focused in modeling methods based on Bayesian Networks. He is responsible of the Maintenance and Dependability speciality in Polytech-Nancy engineers school since 2004. He is a member of the French Institute of risk management IMdR.